The director set out his stall with Following and its old-school film noir flashback structure. In breakthrough title Memento, time run backwards. We see Guy Pearce’s acute amnesiac Lenny shoot a man during the opening credits, soon realising the scene is playing in reverse. The next 110mins unfold end-to-beginning, the audiences piecing together clues as to why Lenny has committed the murder. Even Insomnia, the seemingly straightforward follow-up to Memento, occurs in an Alaskan town of never-ending daytime. In Interstellar, the nearer the crew looking for a new home world get to a black hole, the slower time moves. An expeditionary party’s few hours on a potential new planet is over twenty years for the hapless astronaut left aboard the mother ship. And everyone on Earth, including Matthew McConaughey’s character’s kids. Meaning he’s missed a third of their lives, depicted in a powerhouse scene of video messages spanning two decades. Slowing of time also occurs in Inception, the deeper into a man’s dreams a gang of infiltrators dive. Time turning treacly also infuses the film’s score. Recurring musical motif Non, Je ne regrette rien by Edith Piaf is super slowed for the film’s central soundtrack cue, Half Remembered Dream. In Dunkirk, three different time lines of one week, one day and one hour criss-cross and converge to breathtaking effect. The Dark Knight trilogy also goes temporally screwy, although perhaps not intentionally. 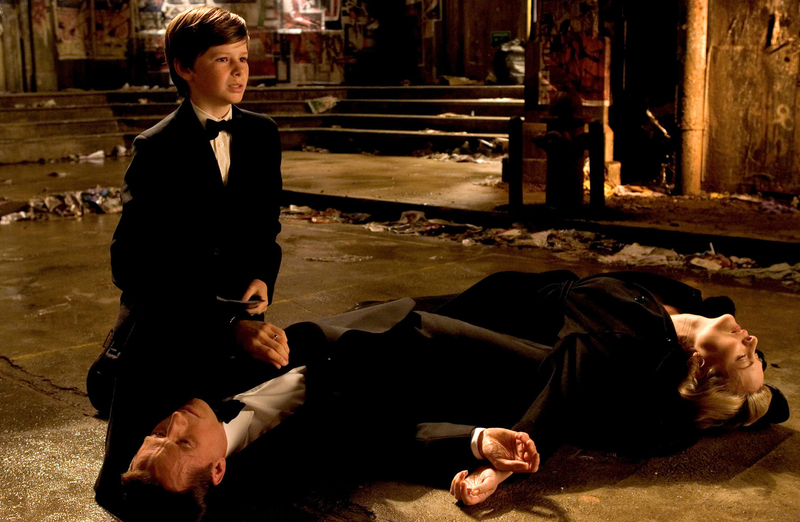 From Batman Begins to The Dark Knight Rises Bruce Wayne is the Caped Crusader for only about 18 months. Not quite the life’s calling of the character in the comics. Bruce Wayne loses his pa to a mugger’s bullet, setting him on the road to becoming Batman. Even Interstellar’s Cooper loses both his dad (before the film begins) and father-in-law John Lithgow on his way to saving humankind. Nolan males react to the death of a spouse by self-destructing rather than confronting their grief. An exception here is Matthew McConaughey’s Cooper, as his job in Interstellar is to save everyone on a self-destructing Earth. But, for the most part, these guys should talk it out more. Guy Pearce’s character Lenny is haunted by a quest to find his wife’s killer, which we find out is a task without end come the close (or beginning) of Memento. Christian Bale’s master illusionist Borden drives wife Rebecca Hall to an untimely grave in The Prestige, his obsessive behaviour also bringing about his own downfall. Even Following features the death of a significant female other, which predictably doesn’t bode well for the male protagonist. Same thing in The Dark Knight. When Maggie Gyllenhaal’s Rachel dies things swiftly go south for Bruce Wayne, before his rejection of the Batman symbol at the close of the movie. It’s hard for Nolan characters to achieve end goals (if indeed, they achieve them at all). During the climax of The Dark Knight Rises Batman just cannot rid himself of a nuclear device (oddly echoing the 1966 Batman movie in which Adam West’s Caped Crusader faces a similar problem). Becoming Batman is a 7-year journey of training and self-discovery in the harsh mountain ranges of the Himalayas. The Prestige’s Borden achieves the ultimate magic trick by having him and his identical twin (or maybe clone) living for years as one person. But, Borden’s perceived mood swings drive his wife to suicide (see The Death of a Wife Ruins Your Life above). Completing the mission in Inception means venturing into not one, not two, but three different dreams. And from inner space to outer, to save the species in Interstellar requires Cooper diving into a black hole with only a space suit for protection. Then there is Dunkirk. Arguably no characters in Nolan’s filmography have had it as tough as those Tommies trying to get off the beach. Bombs from above, bullets from behind and the cold embrace of the sea in front. Nolan’s triumph is allowing the locations and the elements, plus practical effects work and sound design, to convey what a Herculean achievement it was rescuing over 300,000 men off the sand. In a body of work where even time itself bends to the will of the filmmaker, you know surprises lay ahead. Sometimes they announce themselves early on: Memento’s temporally topsy-turvy opening credits, Inception’s plastic dream reality. Other times Nolan saves the reveal for later in the game. Insomnia’s twist occurs at the end of the first act (although credit for that goes to screenwriters of the original 1997 movie, Nikolaj Frobenius and Erik Skjoldbjærg). Following’s labyrinthine crosses and double crosses are exposed as the movie approaches its climax. Nolan’s best twists come from (typically dark) emotional states. The Dark Knight Rises has a key shock saved for the climactic moments and Interstellar features two double crosses deep into the mission. These twists arrive because characters believe they are doing the right thing, motivated by (warped) compassion. Dunkirk follows this pattern with a climactic character reveal that shines light on both the soldiers’ desperation and humanity, making the story point that language barriers should not wall off basic decency. We’re of the opinion Dunkirk is Nolan’s best work to date. But, the director is not without his wobbles. Interstellar is 70% bold filmmaking, 30% bunkum. Anne Hathaway’s “Love Conquers All” speech should have been overhauled before shoot day. Marion Cotillard needed to take another run at that silly death scene in The Dark Knight Rises. And while we’re at it, Batman shouldn’t have been Batman for only 18 months. He’s Batman! If he’s polished off organised crime he’ll go after purse snatchers and burglars. Because he’s the goddamn Batman! Batman doesn’t retire! And while many Nolan movies have meaty parts for women, he seems more invested in the lads than the lasses. We want to see a Nolan film with a female lead, preferably penned by a woman. And then there’s The Prestige. A five-star movie right up until the final moments when it elects to cheat on its central premise with naff science-fiction. Thereby ruining a brilliant movie about two rival master illusionists, each attempting to outdo the other in convincing the eye something has occurred the brain knows cannot be true. Doesn’t matter if Nolan was remaining faithful to Christopher Priest’s book, it’s bobbins and spoils a polished yarn. Since making his Nolanverse debut with Batman Begins, Caine has become the director’s lucky charm. Every film after that first Dark Knight outing has featured Micklewhite Magic, introducing the legendary actor to a new generation of fans. And reminding older audience members of Caine’s talent. The British legend even crops up in Dunkirk – keep your ears open. Nolan’s original composer was David Julyan, who scored Following, Memento, Insomnia and The Prestige. But, Hans Zimmer has become the director’s go-to music man. And although Zimmer has 180 composer credits to his name on IMdb, putting music to everything from The Boss Baby to Pirates of the Caribbean to Chappie, his partnership with Nolan is most exciting. The Dark Knight Trilogy is powered by pounding rhythms mirroring the Caped Crusader’s drive against crime. Inception’s woozy guitar work and moments of bombast match the unreality and sudden panic of night sweats (and gave a multitude of trailers since those Inception “bwaahhhs)”. It also did that Edith Piaf super slowed down thing (see Time Goes Screwy, above). In their recent collaborations, the music has evolved. Interstellar ditched the percussive bombast for a church organ, matching the missionary undercurrents of the story. Although that’s as far as religious parallels go, Nolan coming across as a staunch rationalist. Dunkirk is Nolan and Zimmer’s most effective collaboration to date. Using the metronomic ticking of a clock as the base motif, the German-born composer’s score is an astonishing soundscape of pulsating rhythms, surreal aural effects and an invocation of Elgar’s Nimrod. Riding alongside the film’s teeth-rattling sound design, and often dovetailing with it, the score does the talking in a film with sparse dialogue. Nolan loves IMAX. A persuasive argument can be made for him blazing the trail for narrative storytelling using the format. No Nolan, no Pacific Rim, no Godzilla, no The Force Awakens in IMAX. Okay, also no Batman v Superman and those Transformers sequels. But, a great artist can’t hold the paintbrush for inferior talents. Nolan has also made it a sometime event to preview his movies with a 5 or 6-minute IMAX teaser. Always in December, preceding release of the full movie in July the following year. The Dark Knight’s opening heist wowed audiences in December 2007. The Dark Knight Rising did the same again in December 2011 with its opening mid-air hijacking. And forced the filmmakers to de-muffle Bane’s voice when it became apparent audiences couldn’t understand the masked ‘roid monster’s mutterings. Dunkirk was teased for audiences in December 2016, closing out that annus horribilis with the promise of something cinematically extraordinary to come in summer 2017. These teasers played before lesser movies, leading to inevitable groans when they ended and the main feature began. 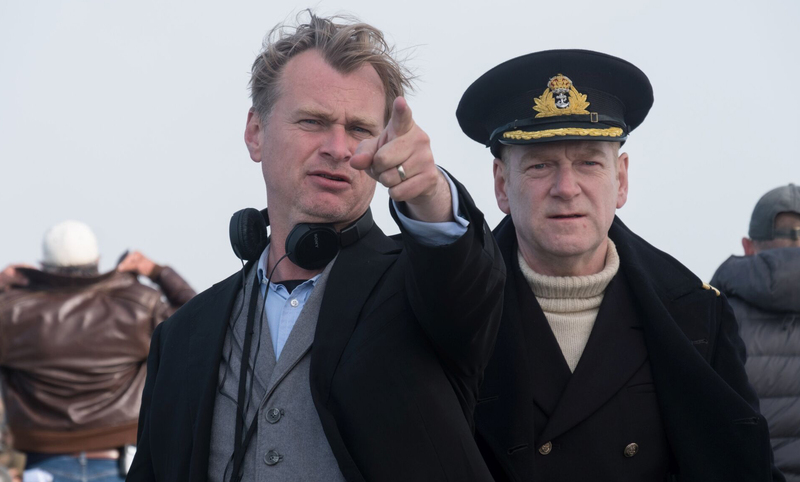 Theatrically, Nolan’s films have crossed $4.3bn to date for an average $430m per outing. Admittedly, Michael Bay’s 13 movies average $450m… But you don’t reach the kind of money Nolan’s films are making unless you’re giving audiences something special. And the British director knows with great budgets comes great responsibility to provide something spectacular. Batman Begins’ finale in The Narrows. The Dark Knight’s bank heist or underground car chase. The Dark Knight Rises’ unveiling of the Batwing. Inception’s corkscrewing corridor dream fight. Interstellar’s evacuation from the water planet or docking with the spinning space station. Dunkirk’s climactic race against time rescue as the Heinkel bomber bears down on shipwrecked survivors. What separates Nolan from most blockbuster filmmakers is he successfully weaves spectacle in with story and character. As a director of set-pieces Nolan proves the real deal (even if that includes miniatures) feels tactile and believable, whereas CGI can tumble into the alienating weightlessness of the uncanny valley. Not to say that Nolan dismisses digital effects. No amount of make-up could replicate the stunning realisation of Harvey Dent as Two-Face in The Dark Knight. Digital airbrushing also proved handy for erasing Tom Hardy’s tattoos in The Dark Knight Rises. And Dunkirk will have employed invisible digital work to remove safety harnesses and hydraulics for scenes when ships go down. But, Dunkirk will stand the test of time because it conveys the harshness and desperation of the siutation with as much practical filmmaking as possible. Real planes, real ships, real extras, real sea, real deal.